The Customize Windows > Computer and Internet > Hardware > What is a Micropump? For many reasons we need miniature things for special works, like bigger pumps there are Micropumps. 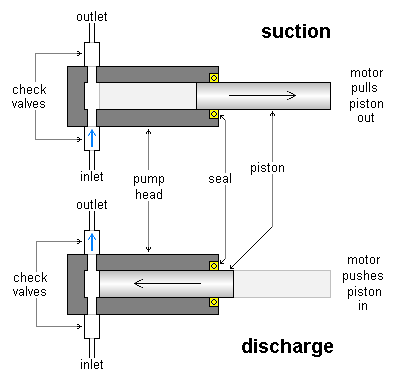 This article tells what is a Micropump. Micropump has official standard description, a micro pump is a pump which has reduced dimensions and also has specifically a microsystem, preferably similar flow rates as the classic pumps. However, in real world, not always the definitions are maintained. As driving system, the pump will have characteristic microfluidics system. The trend towards microsystems is primarily due for by the market requirements. There are a wide range of technical realizations of micropumps. Often macro pumping principles are transferred into the microworld. Oscillating membranes, for example, are often used in micropumps. A peristaltic systems are an imitation of nature. Especially for non-mechanical pumps to large advantages by miniaturization. Here they are partially working with electric or magnetic fields. Due to the small geometries very high electric and magnetic field strengths can be achieved. The effect – electrokinetic, electro-hydrodynamic, electrohydrodynamic magnetic, electrochemical, etc. – is many times more effective than in the macro world. The selection of the micr-pump types is highly dependent on the requirements and to the fluid or gas or its physical and chemical properties. The flow rate and the pump pressure, and the recoverable media vary greatly in the different micropumps. Thus pumping rates can be a few picoliters to several milliliters per minute. Currently available systems on the market are built with different technologies and different modes of operation. Lesser accuracy of throw of fluid will cost the micro pumps lesser. Even at $3 per unit, one can get a Micropump. There are lot of different types of micropumps like dosing pumps. The pumps typically used in aquarium might not be technically micropump but many of them can actually be used with a controller board like Arduino. There are micropumps used for CPU cooling, medical drug delivery etc. Tagged With different types of micropumps , what is a micro pump , what is a micro pump ? This Article Has Been Shared 708 Times! Articles Related to What is a Micropump? A beginners guide on what is overclocking, what it is done, what are the dangers of overclocking. ACPI or Advanced Configuration and Power Interface is an open industry standard for power management in desktop computers, notebooks and servers. Title: What is a Micropump? Cite this article as: Abhishek Ghosh, "What is a Micropump?," in The Customize Windows, June 22, 2015, April 21, 2019, https://thecustomizewindows.com/2015/06/what-is-a-micropump/.